If you’re an experienced in online copywriting, you know that “you” is generally considered to be one of the most effective copywriting power words, ranking right up there with free, new and save. Today’s online copywriters are a hybrid of journalist and marketer, employing the best skills of both crafts. We—and I include myself in this group of online copywriting hybrids—have broader concerns that inform and influence the words we choose. What are the keywords that web surfers use to arrive at your website? What words in email subject lines trigger the highest open rates? The list was compiled by Curtis Circulation Company, a leading national newsstand distributor of magazines, and Linda Ruth of Publishers Single Copy Sales Services, by studying best-selling magazine covers. Used judiciously in online copywriting, power words can grab a reader’s attention and help communicate and persuade. But they are not a substitute for formal structure. Good online copywriting requires an orderly format that moves the reader along to a purchase decision. Power words can be, well, powerful, but they do not work without context. Power words in online copywriting need to be used in cooperation with all of the other tools in the copywriter’s bag of tricks. The experts also recommend tools like SubjectLine.com, and the Email Subject Line Tester to help develop effective, compelling subject lines that withstand sophisticated SPAM filters. 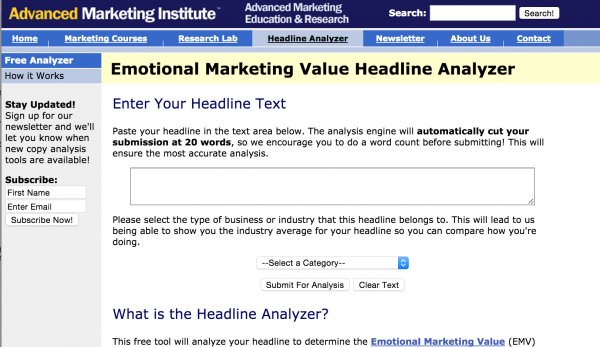 … and the old trusty Emotional Marketing Value Headline Analyzer from the Advanced Marketing Institute. 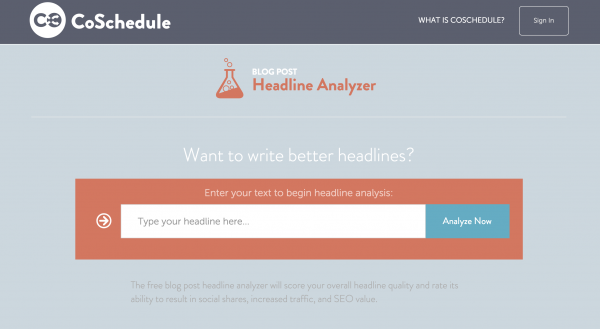 Additionally, a newer tool is Sharethrough’s headline analyzer which gives you a scorecard after you enter your title in. Also, be sure to study Google Analytics to find out which terms consumers are using to get to your website, and use those liberally. Tagged with ad, analytics, email, email subject, email subject line, email subject line tester, email subject lines, google analytics, linda ruth, magazine, magazine covers, magazines, media, multiplatform, multiplatform publishing, online copywriters, Online Copywriting, publishers, text ad. I think anything with a strong call to action is a word that will help generate some good conversions, whether online or offline. Emotional words that connect with the reader therefore, are a prerequisite if you want to connect with your audience very well and sell more product. 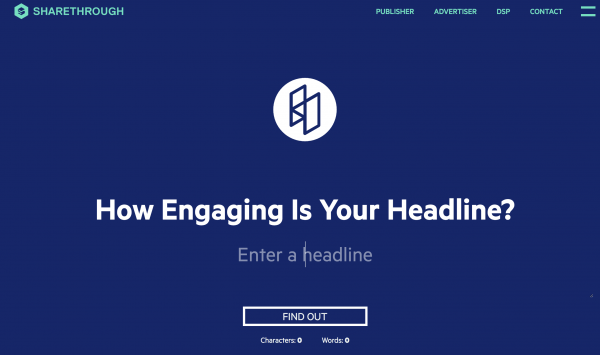 As you mention, the word ‘You’ is a very powerful and strong word to use in any sales copy for any copywriter. 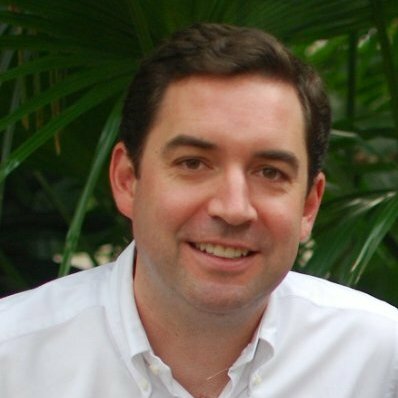 In essence, good sales copy is the bridge between the seller and the buyer. The more powerful, emotional words you can use in your sales copy, the more you will strengthen the bond (credibility, trust) between both parties….enabling a sale to take place easily. Also, don’t forget the power of words like Powerful, Realistic, Amazing, Unbelievable etc. As an “old school” marketer getting up-to-speed with the online world, this article is very comforting and demonstrates that nothing has really changed in human nature and how to write convincingly – it is just the online vehicles that we now use. The bonus is we now have great access to analytics at our fingertips that old school measures of effectiveness would have taken ages to collect and analyse. Inspiring! If I’m benefiting from a Walgreens Register Rewards deal, and wish to purchase a number of plans of diapers, I could just ask the cashier to apply of my purchase. This card is like a debit card. The payroll card has your name as well as Limited Brands logo design published on it. When you decide to obtain the income using payroll card. Play all the stickman games from here without spending a single penny.